CFDs are not new. They have been used since the 1980s in the institutional world, where they are known as equity swaps. They crossed over to the retail world in the UK in 1999. The timing was ideal. As the market soared into technology bubble highs in early 2000, private traders looking for a cheap way to play the market in both directions jumped on board. A change in the law meant CFDs and spread betting could be offered in Australia for the first time in 2002. While spread betting is a more popular product in the UK because of its tax treatment (profits are treated as betting wins and not taxed), CFDs in Australia not only have left spread betting well behind, but also have proved a serious competitor for traditional share trading. CFDs are so popular in Australia that every major Australian stockbroker now either offers them or is in the process of adding them to their product list. 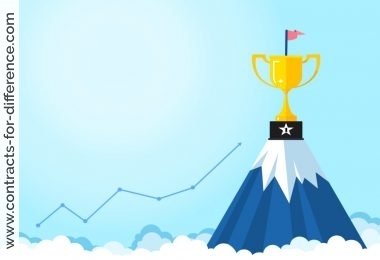 CFD provider CMC Markets’ managing director David Trew says his company is now in the same league as the top tier of traditional stockbroking firms in terms of volume. CFDs are bringing about a trading revolution. 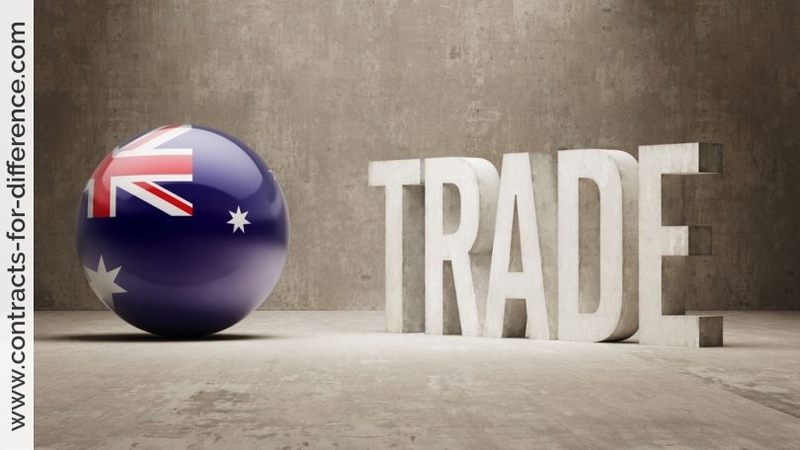 Andrew Leelathaepin, sales consultant at Man Financial, says CFD trading in Australia will probably follow the UK, where 40 per cent of turnover on the UK stockmarket is attributable to CFDs. There is no doubt that the revolution in CFDs can be attributed in part to the spectacular bull run on the Australian stockmarket, but the product itself has a number of qualities that make it attractive. Even though share CFDs are a type of derivative, they are more like the underlying product or shares than is any other type of derivative product. The price action for a CFD mirrors the price of a share. 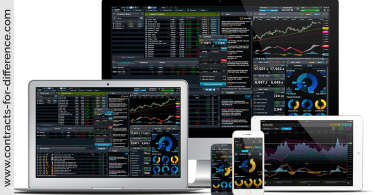 This has made CFDs highly accessible to traditional share traders who shun the complicated and sometimes inequitable pricing of other derivative share products like options and warrants. Because CFDs are so much like shares, they have attracted a large market of traders who would normally regard derivative trading as too sophisticated or risky. CFDs are the only share derivative product that allows traders with long positions to collect dividends and other benefits of holding the underlying shares, such as rights issues. The only benefit they do not have is voting rights. CFDs are cheap in two ways: brokerage is inexpensive and they have a low capital requirement. For only $10 a trader can take a position up to the value of $10,000, and most CFD providers charge 10 basis points after that. This makes trading CFDs cheaper than trading with discount stockbrokers. The low capital requirement is also a bonanza. A trader can establish an account with as little as $1,000 on a credit card and have access to $10,000 to $20,000 worth of shares for that small outlay. Margin rates of five per cent or 10 per cent of the value of the underlying position provide extraordinary leverage and have allowed a generation of traders to participate in the stockmarket with very little capital. Traditional share trading makes it difficult to make money when the market falls. Short selling shares is bound by various rules and limitations, including the downtick rule, stock availability, company buy backs and full brokerage. The downtick rule means a short position can be taken only on an uptick in price – not when the price is collapsing (which is the obvious time a trader would want to short sell). There is a limited number of stocks that can be short sold in the traditional sense and these are not always available. Before a short position can be executed the broker must find the stock to borrow against the position. If a company does not want to lend out stock, a short position cannot be entered. It also means that if you have a short position in the traditional stockmarket and a company starts a buyback program, that position is terminated. Because of the extra effort involved in executing a short share position, your broker will charge full commission. Going short with CFDs is not bound by stock lending limitations or the uptick rule. A short position in CFDs is entered with the same cost and as simply as entering a long position. So CFDs have the potential to be just as popular in a bear market as in the current rising stockmarket. Short positions also receive an interest payment, usually two or three percent below the RBA overnight rate, calculated on the underlying value of the position. Margin loans traditionally soar in popularity during a bull market. However, they are a clumsy, expensive investing tool when compared with CFDs. First, they require a larger margin – usually 25 per cent of the underlying value of the share holding. Secondly, they attract full brokerage and a higher rate of interest. CFD positions attract interest of around three per cent above the RBA overnight rate, while margin loans tend to be four or five per cent above the RBA rate. A margin loan facility also attracts a charge to close a position if the stock price falls. Most CFD providers offer a completely flexible stop loss facility at no extra cost. Although trading CFDs is similar to traditional share trading in many ways, there is a major point of difference that can make CFD trading seem simultaneously fabulous, addictive and scary. Compare a trade in BHP Billiton (BHP) using traditional shares with a trade using CFDs. Suppose a trader buys 1,000 BHP shares in March this year when it breaks the old highs. The entry price is $26.64. The value of the position is $26,640 and the trader pays the full value plus brokerage to hold the position. 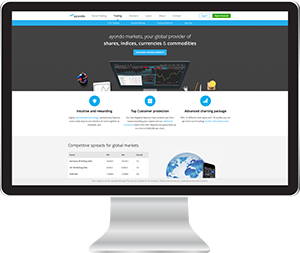 The CFD trader does the same trade in the CFD market. His margin requirement is five per cent of the underlying value so his outlay to hold the position is just $1,332. The latest price for BHP is $32. The value of the share position is now $32,000. The CFD trader has a profit of $5,360 sitting in his account, which can be withdrawn or used to fund new positions. The investor with the traditional share position has nothing until the position is closed or cashed out. But what if, instead of rising in that period, BHP falls to $22? The traditional share trader watches his position decrease in value to $22,000, but does not have to pay anything. However, each day the position is in loss the CFD trader has money withdrawn from his account. By the time BHP is worth $22,000, the accumulated losses of $4,640 have been withdrawn to cover his losses. 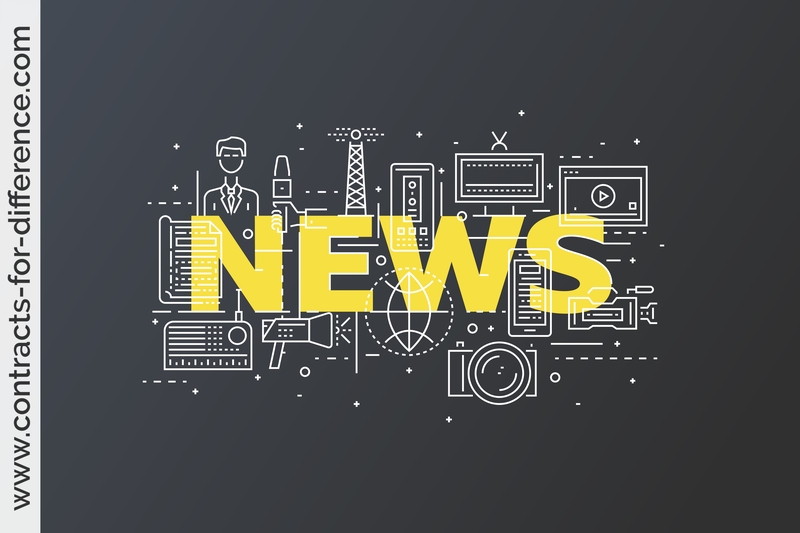 The CFD trader also pays an interest charge on the total value of the position, because a long CFD position is equivalent to borrowing the money from the CFD provider. If he has less than the loss amount in his account he will go on margin call and be asked to increase funding to the account to cover the falling value of his investment. If the trader cannot fund the losses, the CFD provider will close out the position. With an investment of $26,640 the traditional share trader has an un-materialised loss of 17 percent on his investment. For the CFD trader the loss represents a materialised loss of 348 per cent of his initial investment. So the old cliché of the double-edged sword is indeed the case with CFDs. A CFD trader on the right side of the market can make exponential gains. A CFD trader on the wrong side of the market can lose a lot of money very quickly. There is, however, one important feature of CFD trading that greatly reduces its risk: the stop loss order. When CMC Markets introduced their CFD product to the Australian market in 2002 they promoted their stop loss facility. The promotion educated many Australian traders, who had previously never considered using a stop loss. The new awareness of stop loss orders encouraged traditional stockbrokers to also offer a stop loss service. However, because not all stop loss orders are executed in the same way, not all CFD providers and stockbrokers offer the same degree of safety with their stop loss facility. The unsafe stop loss turns your stop order into a limit order that may or may not be filled. The safe stop order turns it into a market order, so a stop will always be executed. The safe stop loss provides an element of confidence that trading other derivative products and traditional share investing does not. It is important to check the exact procedure of stop loss execution with your CFD provider before you sign up. Two real life examples of CFD trading may give potential CFD traders an insight into the realities of trading this product. The first trade was in Excel Coal. I bought my first parcel of 1,500 EXL share CFDs on 14 July 2005 at $7.19 after Excel rebounded from a previous low. I placed a stop loss on my online trading system at $7.02. As a breakout trader I waited for more evidence of strength before buying again. It came on 20 July, when I went long another 3,000 EXL CFDs – 1,500 at $7.25 and 1,500 at $7.48. With a larger position at risk and the market moving in my favour throughout the day I trailed my stop loss level from the initial $7.09 to $7.23 and then to $7.39 by day’s end. The next day the market gapped up to $7.80 and I was a little concerned there would be a larger pullback, so I sold 1,500 EXL CFDs at $7.77. When the price reversed and started to rise again I bought them back at $7.88. That day the price closed at $8.15 and I was long a total of 4,500 EXL CFDs. Throughout the next day I again trailed my stop loss. I moved it higher three times – from $7.69 to $7.83 to $7.97. 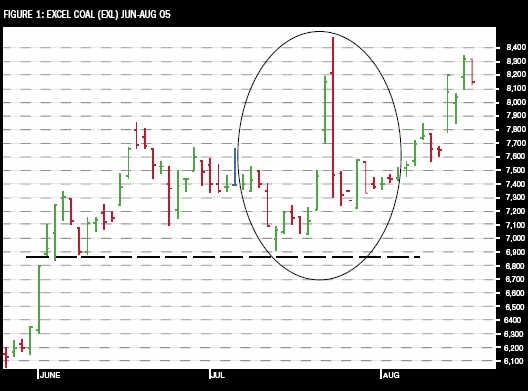 On 22 July the price made another gap higher at $8.22. In a few minutes it was as high as $8.48. Seeing the speed of the gains and noting that EXL often has a three-day period of strong rallying before making a correction, I trailed my stop loss aggressively. I was stopped out of 3,000 EXL CFDs at $8.28 with the remaining 1,500 stopped out at $7.97. The chart in figure 1 shows the price action for EXL over the period of the trades. This example highlights the ability to make exponential gains through the strategy of adding to winning positions. 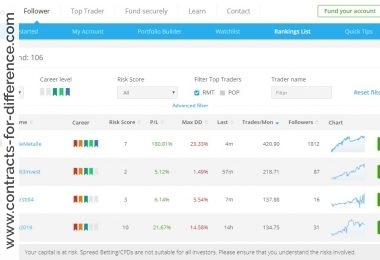 As a trade moves into profit, the profit is instantly credited to your account and these new extra funds are then available to accumulate an even bigger position in a winning trend. The scary side of CFD trading is demonstrated by a trade I took in Jubilee Mines (JBM) (see figure 2) in early September 2005. The set-up was similar to the EXL trade with the price giving an initial buy signal by rebounding from a previous low. 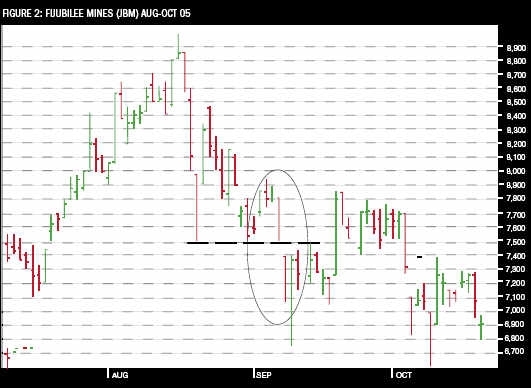 I initially bought 2,000 JBM at $7.87 on 5 September, placing my stop loss order at the reasonable level of $7.69. A week earlier I had been stopped out of a position in JBM only to see it go back in the original direction. As a result I thought that I might be putting my stop loss order too close, so I decided to move it down to $7.51 – just below the last correction low. Just before the close I realised the stop would have been better based on an earlier low at $7.49, so I removed the stop altogether. As the market closed it settled right at the previous low of $7.50 and I had no stop in the market. At that moment I knew I was holding a potentially disastrous trade. I had resisted taking a safe and relatively cheap exit at $7.69. But the market had given a very negative signal by making a long range day, closing on the lows, at the precipice of a major support level. By day’s end I was sorry I had not exited that day at the lower level of $7.51. Not surprisingly, the following day the market gapped down to open at $7.39. I exited the trade at market and was filled at $7.30. The loss was $1,140. It would have been only $360 if I had left the initial stop loss in place. Not working a stop loss order, removing a stop loss, being indecisive about your stop loss level or having a mental stop loss order instead of one placed in the market, are all ways to make CFD trading scary. 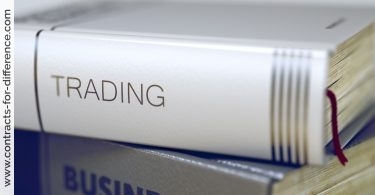 If you don’t have the discipline to trade with a stop loss order, CFD trading is not for you. No matter how good you think you are at predicting the market, in the end you will not make money without stop losses. If you place safe stop loss orders and make the most of trends by exploiting low margin requirements, with real time position-keeping adding to winning positions then CFDs can be truly fabulous.